We are known as the chief Exporter and Trader of the latest Draining Basket in India. As the name suggests, the Draining Basket are available with wide net like structures on all sides. These structures are proved really useful for draining different laboratory apparatus after washing them. 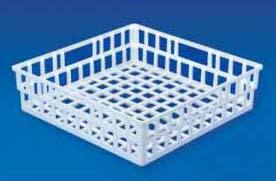 Made of polypropylene, Our Draining Basket can be repeatedly autoclaved.